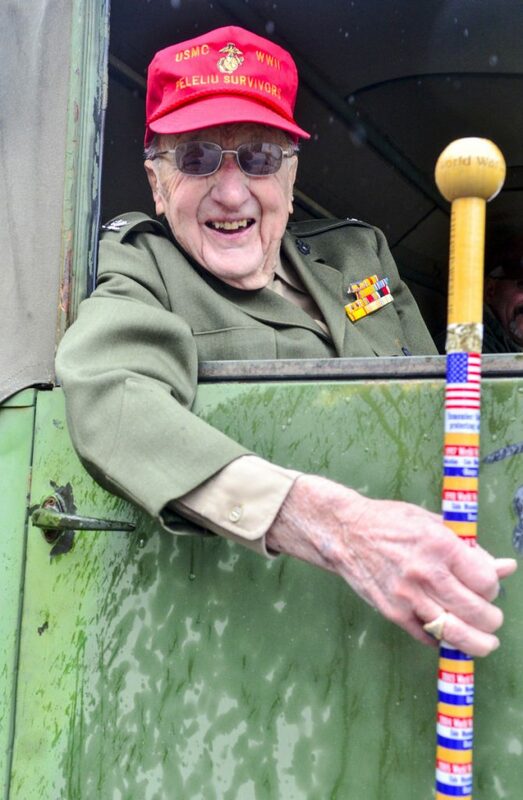 Cliff West, 98, shares battle memories on the 243rd birthday of the Marine Corps. READFIELD — At the Readfield Veterans Day recognition service Saturday, Cliff West proudly wore his U.S. Marine Corps winter service uniform of green wool over a khaki shirt and tie with the eagle designating the rank of colonel. It was the 243rd birthday for the Marine Corps as well. West, 98, of Winthrop, had added a red baseball cap, one marking his status as one of the survivors in the World War II battle for Peleliu island, which resulted in heavy losses for the 1st Marine Division, in which he was a forward air controller calling in airstrikes. The division landed on the Pacific island on Sept. 14, 1944. The attack was intended to support Gen. Douglas MacArthur’s return to the Philippines. 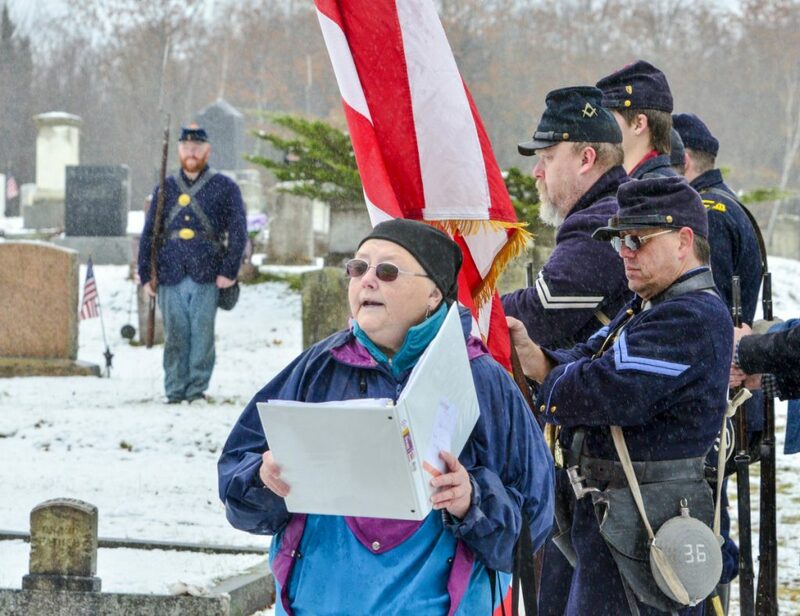 Readfield historian Dale Potter-Clark speaks during Veterans Day observances Saturday in Readfield Cemetery. When badly needed water arrived on day 2, many Marines drank it before realizing it was tainted by oil, the story said. The 11,000 Japanese troops had dug in for a long defensive battle. West was involved in the Battle of Okinawa as well, “and after that it was all administrative work.” Saturday was the first time he had attended a Veterans Day ceremony in Readfield. Veterans Day, formerly Armistice Day, marks the anniversary of the armistice that ended World War I on Nov. 11, 1918. Sunday is the 100th anniversary of that armistice. West was content to watch, listen and answer questions from people who walked over to greet West and shake his hand. He said he was pleased to see so many people turn out for the ceremony. West, who enlisted in March 1942 and retired as a colonel in July 1968, stood in the light rain as a dozen members Civil War re-enactors from Company A, 3rd Maine Regiment Volunteer Infantry fired a volley and then sounded taps on a bugle.